On the hunt for the ideal Christmas present? We've picked out 15 gifts for architects and designers, including a pair of midnight-blue watches, a brutalist architecture calendar and a book that offers a glimpse inside North Korea. 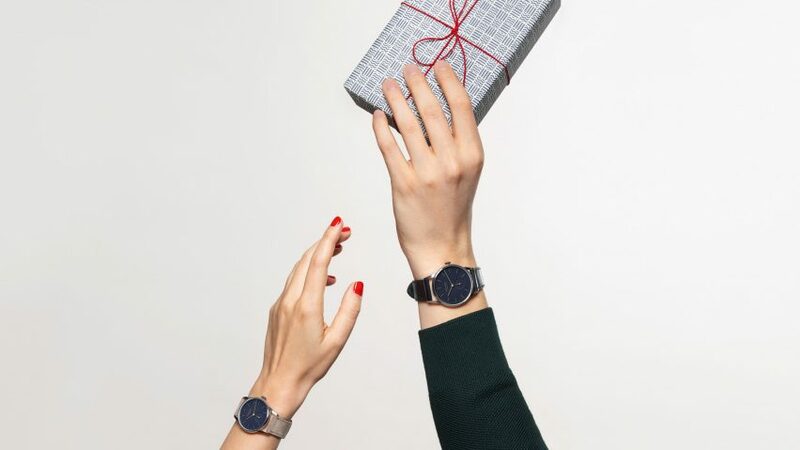 These midnight blue watches are the latest update of Nomos Glashütte's Orion series, which was first introduced in 1992. Gold hands and indexes complement the dark hue, with domed sapphire crystal glass forming the face of each. The timepiece comes in two different sizes: the larger version is 38 millimeters in diameter, while the smaller is 33. To create the geometric prints decorating this set of notecards, London-based StudioSmall drew on the facades of buildings including Sante Fe University of Art and Design and the Pulman Hotel in New Zealand. Produced by Case Furniture – which is also located in the English capital – the Architectural Cards includes three versions of nine different designs, making a total of 27. Each is left blank inside and comes packed in a white storage box. Fine art photographer Hans Carl Finsen has captured the stacked form of New York art gallery The New Museum, designed by SANAA, in this limited-edition piece sold by Saatchi Art, of which there are just 10 available. Printed on matte Endura paper in a mix of colour, black and white, it has the quality of a hand-drawing or digital image rather than photograph. Each comes signed, with a certificate of authenticity and an edition number. Dark silicone rubber gives a playful look to the protruding volume, stop and start buttons adorning this speaker, which is available at WallpaperStore. The exterior, which is available in green, pink and grey protects the device from water so music lovers can enjoy using it in the bathroom and kitchen. Designed by French architect and designer Marc Berthier for Lexon, the device plays music via an auxillary cable or wirelessly with Bluetooth, and is recharged with a USB port. Retailer Warm Nordic has reissued a sculptural lamp created by Danish designer Svend Aage Holm-Sørensen in the 1950s. Two criss-crossed legs form the base of the mid-century design. One supports an upturned lamp that directs light to reflect off a metallic disc, which is held at the end of the other and pierced by a brass spike. Half grey, half green, this bag forms part of the Sandqvist Urban Outdoor range. The intention is that it is sleek enough for the work commute and tough enough for adventures. The roll top's water resistant material makes it durable in harsher climates, while a number of zipper and slip pockets include space for 13" laptops, as well as items that need to be quickly accessed while on the go. Give your loved one the treat of self-care with Aesop's body kit, comprising a face cleanser, a hand balm and moisturising mist. Called Concord, the complimentary three-piece set draws reference from the Robber Cave Experiment by famous social psychologist Muzafer Sherif, which champions team work and harmony. Berlin-based luggage label Horizn has created this dark-olive sleek carry-on case for jet setters and digital nomads, including a removable smart charger to boost devices on the go. The unisex H5 Cabin has a hard polycarbonate shell to make it lightweight to carry but protected from damage during travels, and is set on wheels to make trips smooth. Inside there is a built-in suppression system and a laundry bag to organise clothes. The over-the-ear headphones have a leather-covered headband and ear cushioning to maximise comfort for the user, and is available in Spring/Summer colours Aloe or Steel Blue. Other key features include a battery life of up to 19 hours and Bluetooth technology to play music wirelessly. Designed by Finish architect and designer Alvar Aalto in the 1933, the Stool 60 features wooden legs that are curved and mounted underneath the round seat. The stool, which is produced by Artek in a variety of colours, can be used as a chair, a small table or for displaying objects. The design also enables several stools to be stacked up when not in use. Swedish garment care brand Steamery has created this portable fabric shaver to cut bobbles and fuzzballs off clothing, helping to keep winter cashmeres and wools fresh. An aluminium cover pops off the matte Pilo Fabric Shave to reveal the sharp razor blade, while the top is shaped to be easily held. The battery-powered device, which comes in black, pink or grey, is charged up with a USB cable and lasts for 50 minutes of continuous shaving. Brutalist works by Le Corbusier, Marcel Breuer, and Paul Rudolph adorn the pages of this calendar by Blue Crow Media. Photographs of the brutalist structures occupy the top half of the spread with a caption written below. Dates are then placed in rows the bottom in bold text that draws on the architectural style. A marbly pill-like chunk, a blue "painter's palette shape" and a circular metallic disc are laid over each other to form this side table designed by Jaime Hayón. Available at Luisaviaroma, the table forms part of a series that the Spanish designer has created for &Tradition. Each includes three different shapes stacked on top of a gridded black frame. Featuring over 200 photos, this book by Guardian architecture and design critic Oliver Wainwright offers a glimpse of North Korea's bizarre and bold architecture. Highlights of Inside North Korea, published by Taschen, include a Wes Anderson-style hotel, a theatre with scalloped walls and the country's version of Paris' Arc de Triomphe. Help to keep your architect and design mate tidy with this handy desk organiser, which Paris-based designed Arik Levy created for Vitra. Pens, post-its and notebooks can be stored in the different-sized apartments, with a handle making it easy to move around. Chose to either make a statement with the green, pink or blue model, or blend in with monochrome designs, all available for purchase at Luisaviaroma.